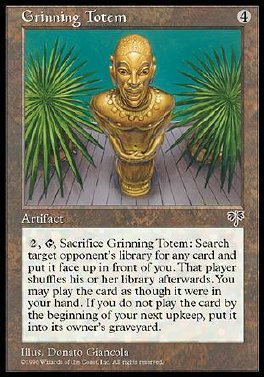 2, T, Sacrifice Grinning Totem: Search target opponent's library for a card and remove it from the game. Then that player shuffles his or her library. Until the beginning of your next upkeep, you may play that card. At the beginning of your next upkeep, if you haven't played it, put it into its owner's graveyard.